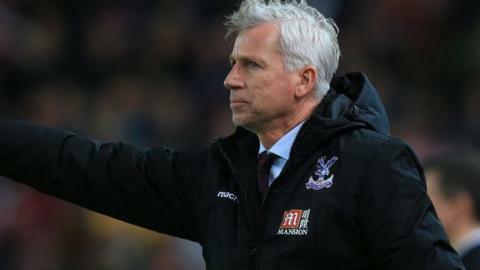 Crystal Palace manager Alan Pardew is in discussions over a new contract at Selhurst Park and is confident he can bring success to the south London club. Palace were in the bottom three when Pardew replaced Neil Warnock last year, but having finished 10th last term they are fifth after 19 games this season. "The reason I am talking to them about a new contract here is because I feel we could go forward," Pardew said. "There is no point in me staying if I don't have the ambition." Changes are taking place off the field too as last month Palace agreed a deal for American investors Josh Harris and David Blitzer to take a large stake in the club. Harris, Blitzer and chairman Parish will each own an 18% stake and a "initial £50m injection of capital" will help to develop the club's stadium. "When I came here the most important thing was to go from the concept of a manager who was trying to stay in the division - which I think Neil Warnock's mentality was - to a manager who wanted to finish higher than that," Pardew said. "The biggest difference I made here was changing the mentality of the players to make them think they could go and win. "I take that as massive for this football club at the time. I think there was a lack of belief. I need to win trophies - that is probably the thing that you can hold against me as a manager, so I want to win trophies." The 54-year-old, who played 128 games for the Eagles from 1987-1991, said a difference in transfer policy was a major factor in him leaving Newcastle for Palace. "Steve Parish's assurances on transfers were key to me coming here. He said I would have full control over transfers," Pardew revealed. "The way transfers were done at Newcastle I didn't entirely agree with and I didn't want that here."